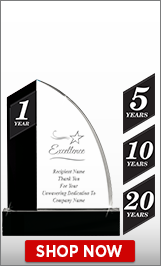 Crown Awards is America's largest years of service awards manufacturer. 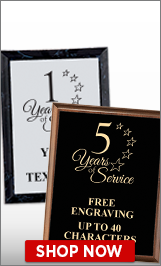 Whether you need years of service trophies, years of service medals, years of service plaques or more, our years of service awards are sure to fit your award needs. 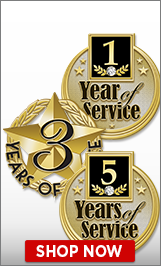 Recognize employees years of service with our years of service pins, years of service crystals and much more! Crown Awards is proud to offer a wide selection of Years Of Service Awards and trophies for recognizing and rewarding those who truly deserve it. Our Years Of Service Awards are a wonderful way to show your gratitude and appreciation to employees, business partners, and clients alike. 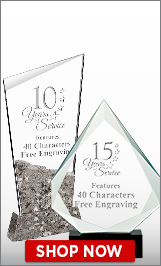 Choose from a variety of excellence awards including Years Of Service Crystals, Years Of Service Pins, and more! Here at Crown Awards, our goal is to help you find what you're looking for. Whether it's one hundred Years Of Service Pins for an entire office or one Years Of Service Award Crystal for an outstanding employee, we've got you covered. With an expertly trained team of customer representatives and an online catalog of our best products, Crown Awards is the best source for top quality Years Of Service Awards. At Crown, we understand the importance of a hardworking employee. For those times when a simple "thank you" just isn't enough, reward your employees with the recognition and appreciation they deserve. 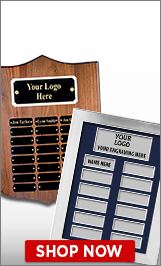 Our recognition awards are ideal for employees, businesses, and corporations alike. These beautiful corporate gifts are the perfect way to recognize your employees that will last a lifetime!